Books and their authors can be very influential. They can initiate widespread awareness of a subject and maintain loyal followings long after their best works were published. When you read books about Lean management, or follow influential authors, how confident are you that the information is accurate? Do you even ask yourself that question? 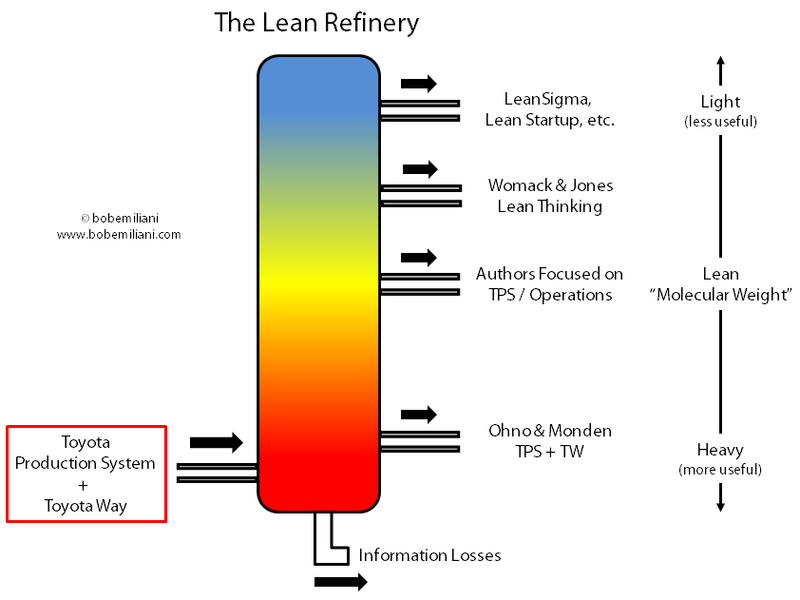 Let’s examine what happens when authors write about Lean management. The process for refining crude oil provides a useful analogy, but in reverse. In the thermal distillation of a feedstock such as crude oil, all of the products are useful, ranging from low molecular weight petroleum gas that emerges from the top of the distillation column to super-high molecular weight bitumen at the bottom. But, when authors write about Lean management, some of the product is much more useful than others. The image at right illustrates what has happened over the last 30 years. The product that comes out at the top of the distillation column is much less useful than the product that comes out near the bottom. The left side shows the raw feedstock: Toyota Production System plus The Toyota Way (TPS+TW). Toyota’s management practice is transformed when it is written about. The transformation occurs, whether one likes it or not, because details experienced in actual practice are left out. They can be left out for the sake of brevity, a desire not to disclose key elements, unclear understanding of certain ideas or concepts, a lack of information, and so on. These are the information losses exit the bottom of the distillation column. This is why Taiichi Ohno said of TPS: “It cannot be learned from a book… because much of the method runs counter to conventional wisdom” (NPS, p. 153). The product that comes out at the top of the distillation column in less useful than the product that comes out at the bottom – or even the feedstock that initiated the distillation process. Taiichi Ohno wrote about the Toyota Production System in 1978 (in Japanese, 1988 in English), followed by Yasuhiro Monden in 1983. These descriptions of TPS+TW are closest to the initial feedstock: the way TPS+ TW was actually understood and practiced at Toyota. Most people misunderstood TPS as a manufacturing or operations management practice, hence the term “Lean manufacturing,” which fell out of favor around 2007 but is still used by some people today. Therefore, they ignored the Toyota Way (the “Respect for People” principle) and focused their writings narrowly on the manufacturing aspects of TPS. Thus, more information is lost. Then, at the top, we have new formulations that attach other ideas to Lean such as six sigma or entrepreneurship, while losing still more information. Information losses are to be expected. However, information losses are exacerbated by authors who lack first-hand experience with TPS+TW; of actually creating material and information flow in the workplace. Therefore, they have no choice but to distill the feedstock, TPS+TW, into simplified forms. As part of this process, books get written about new things such as value stream maps, A3 reports, gemba walks, six sigma, startups, etc., in part to keep people interested in the topic and also to help them grasp both the challenge and the opportunity. By inference, readers are led to believe these things are necessary elements of the original feedstock, and which therefore must be applied in practice. They spend a lot of time doing these new things, often because they are formulaic and can be done with little thinking, and invariably lose sight of the purpose and goals of TPS is and what TW means and how to practice it. This, in turn, causes huge delays and lots of rework. People spend years working to be like Toyota in mindset and daily practice, yet make little progress. Management becomes disappointed with the results, and they often fault TPS+TW rather than their own poor understanding of TPS+TW and lack of personal engagement in kaizen. It is great that people want to buy books to help them learn. And they do others things as well to learn. However, people who want to learn should be discriminating in their sources of information and influence. Where, you may ask, do my books lie on the distillation column? It is near Ohno and Monden. I was trained in TPS+TW by former Toyota people when I worked in industry, and which continues to this day. Plus, my work as an academic means that I do thorough research to ensure the accuracy of information that I present to readers – especially when it comes to the history and evolution of progressive management.